On a Christmas 20 years ago, a high school girlfriend offered me a choice between two colognes that she may or may not have shoplifted: Chanel Pour Monsieur and something else (what it was I don’t recall). I chose without smelling either, but then it wasn’t a difficult decision: Chanel had a luxurious mystique, even to my 15-year-old mind. I didn’t regret it. Against the other bottles on my dresser—Drakkar Noir with its pungent patchouli and oakmoss and the sharp pine and citrus of Polo—Chanel’s subtle woods shrouded by powdery notes were mature and sophisticated. Simply put, Chanel made me feel like an adult. I wore it for a few years after that, alternating with some other colognes, until over-zealous application of all of them burnt my nose out. After about a 12-year fragrance break I gradually eased into it again and thought wistfully of my old Chanel. One evening a few years ago, an attractive young woman walked by me at a theater, followed by a light breeze of something familiar. Suddenly I was dizzy with memories: it was Chanel Pour Monsieur. Nostalgia gave way to confusion as I pondered how it made me feel to smell an old favorite cologne on a woman (Is it still masculine? Could I wear it again after associating it with a woman?) The next day I resolved to replace my long lost bottle. That wasn’t easy. I went to Bloomingdale’s, but the Chanel men’s scents they showed me were nothing like what I remembered. Later I went to Saks. The Chanel counter staff lined up everything they had, but again, nothing was remotely close. I asked if it might be out of production, but the Saks reps knew nothing. Through some casual Internet research, I stumbled upon rumors of reformulations. What may have happened, I determined, was that Chanel changed its Pour Monsieur formula in about 1989. The bottle I received in 1990 was the last of the old style, which was created in 1955. The new version smelled generic to me. It didn’t have the same light lemon top notes anymore, nor the powdery finish. Those notes were replaced by something more common smelling, and decidedly less pleasant. Fortunately, the old formula seemed to be in production still, and was available in Europe (indeed perhaps everywhere outside of the U.S.). I visited a Chanel boutique in London last summer giddy with anticipation. Would it be the same? I was disappointed at first. It did not smell the same. I spritzed my wrist anyway, and walked out of the store. A block away, it hit me: this was it! I walked straight back to the store and bought the bottle. This entry was posted in Fragrance Review and tagged Chanel Pour Monsieur, Drakkar, Luca Turin, Men's Colgone, Men's Fragrances, Men's Scents, Polo. Bookmark the permalink. I agree completely, the concentree version smells old and dusty. 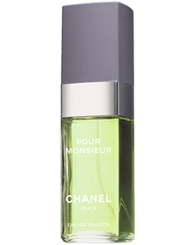 The original pour monsieur (originally called Chanel for Men in the US) is far superior and much classier. I recently won a vintage bottle from the UK and have been quite pleased with the results. Such a shame they don’t carry it here in the states! The concentree is just awful. Why on earth has Chanel taken the equivalent of their #19 for men, and stopped selling it in the U.S. It is typical of their lack of marketing savvy and I fear that their stupidity will ultimately end, or worse, change, the European production. I am attempting to have the Fragrance Shop in North Carolina make me the formula in a perfume. they should be able to do it, but if not them, then somebody else. Fragrances are very often recirculated under another name, so perhaps it will reappear under another name or even under a women’s fragrance. Such a pitty.